After 18 years of living in New Hampshire with regular visits to the Manchester area, I’m still occasionally finding some new neighborhoods to explore, along with a few places to eat. In this case, we were taking a shortcut around traffic and ended up getting off on the West Bank of Manchester (the French “Notre Dame” neighborhood). 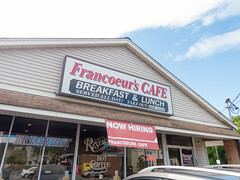 While that part of town has some great eats (like, say, Chez Vachon or Rita Mae’s, we decided to head south a bit and try a new-to-us place, Francoeur’s Cafe. Located on Main Street just a bit west of the Queen City Avenue exit from I-293, Francoeur’s is a relative newcomer to the scene, since the last time I came through this part of town, this was the Daniel Webster Diner. But Francouer’s definitely gave the space a nice makeover, it has a nice, clean, and airy dining area with a lot of seating. Settling in at a nice window seat, we looked over the menu at the variety of dishes, but when it comes down to it, the menu is your usual eggs, omelets, pancakes, and waffles “American” fare, with a bit more kielbasa than I usually see on most menus (since Manchester doesn’t have the largest Polish population). 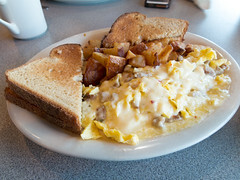 But being of Eastern European descent, I couldn’t resist, and went for the kielbasa and cheese omelet, while Carol opted for the hash, eggs, and beans breakfast plate. My omelet came out relatively quickly, and was a rather nice rendition: some fairly spicy kielbasa that had gotten a nice sear before getting integrated into the omelet, since decently done homefries of the deep-fried variety (I usually prefer griddle-cooked homefries, but these were pretty good) and toast. A good combination of cheese and kielbasa in each bite, and I was certainly pleased with this breakfast. Carol did pretty well with the hash as well. I adore a good hash, but too often a place’s homemade hash ends up not being any better than the canned stuff, but that wasn’t the case here: this was definitely a quality house-made hash with good chunks of corned beef and a nice sear, although I think it could have used a bit more seasoning. 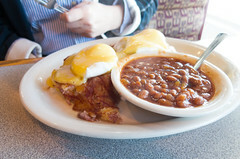 That was my take with the beans as well; these were obviously house-made Boston-style beans with a good tangy sauce and nice tender beans, but again, just a bit more spice may have added some pop here. But overall, a pleasing breakfast. 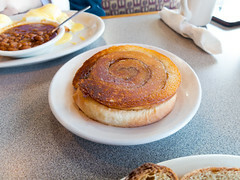 Finally, we also ordered a featured item off the the menu; their cinnamon roll. Served up sliced and grilled, this is a lot different than most rolls I’ve had (usually I like my oven-roasted with a nice glaze on them), and while I wouldn’t want this style every time, it was a nice little side dish to pick at with a good cinnamon flavor; a bit more like monkey bread than the usual roll. But I’ll have to say, while I’ve still got a lot of other favorites around Manchester like the Red Arrow and Chez Vachon, or even Purple Finch down the road in Bedford, I actually rather like Francoeur’s and will try to work them into the rotation; they are friendly and efficient, the food good, and the prices reasonable. Certainly one of the better options in that part of town.